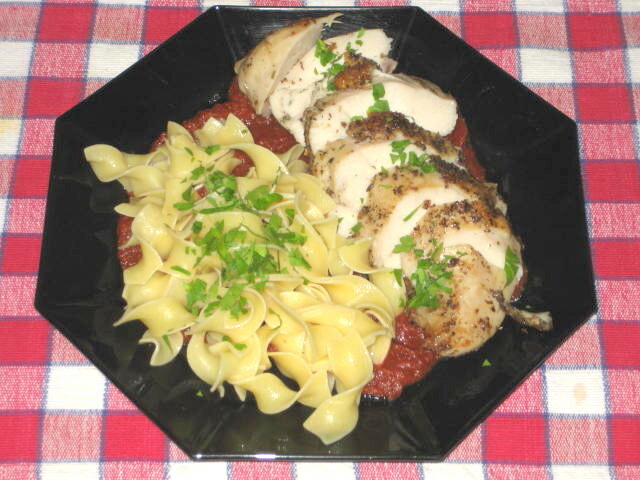 This chicken breast roll can be served hotwith buttered noodles and tomato sauce or at room temperature thinly sliced andserved with crusty bread. Either way it is a great meal for all seasons. I usedmozzarella for stuffing but any melting cheese or even blue cheese orcombination of both is great. Use of thermometer is almost a must since chickenbreast dries very quickly, you don’t want to go over 160 °F. Remember that breastwill keep cooking after being removed from oven. As far as seasonings goes,again, it is up to you. Touch of heat is always nice in any meat roll, Iusually use chilies pepper flakes and freshly ground white pepper. Preheat oven to 350 °F and place the rackin middle of oven. Season the cutlet with herbs, salt and pepperand evenly spread the cheese on top stopping about 1” from edges and top. Startrolling away from you making sure that roll is tight. With one full turn leftfold over the sides to enclose the roll and finish the roll. Secure the roll bytying loops with butcher twine at 2” intervals. Preheat non-stick frying pan with2 Tbs. of olive oil on medium high and brown the rolls on all sides. Place thepan in oven and roast until thermometer reaches 155 °F, about 25 minutes. Whendone, remove from oven and rest for few minutes then cut slice s 1/2” thick.Serve with buttered noodles and tomato sauce.